I have had a busy, fun week. 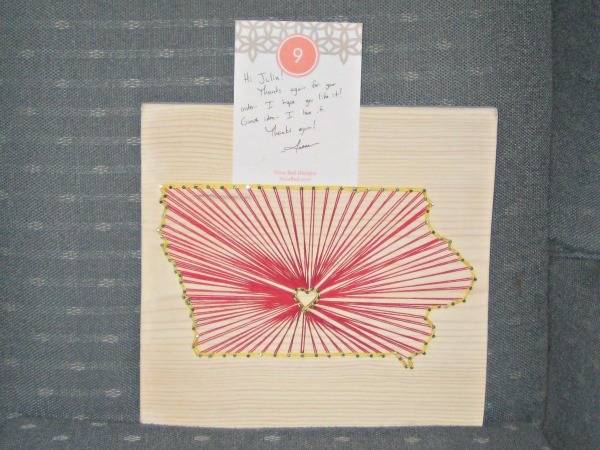 But first, I want to share a handmade creation that I bought from Jesse over at Nine Red. Custom string art to go on my in-progress geography wall. He was great to work with. The heart is over Cyclone Country because that’s where Mr. TellBlast and I spent our engagement and early marriage years. The wall is in progress because I chose some new photos to put on it, which means I need to rearrange where everything hangs. I have been using birthday money from my mother to frame the new photos, and still have to get two more frames. I have everything in a black frame with a white matt. The hardest thing has been finding wall frames for 4 x 6 inch pieces. Everything I find is tabletop, not hanging. Which led to settling on an 8 x 10 inch frame for a 4 x 6 photo. It will all work out. My week was very full. I had professional development for two days. I’ll be able to give homeschool programming that is focused on water. I’d done some of it with my own kids in the past, and learned a few new things. 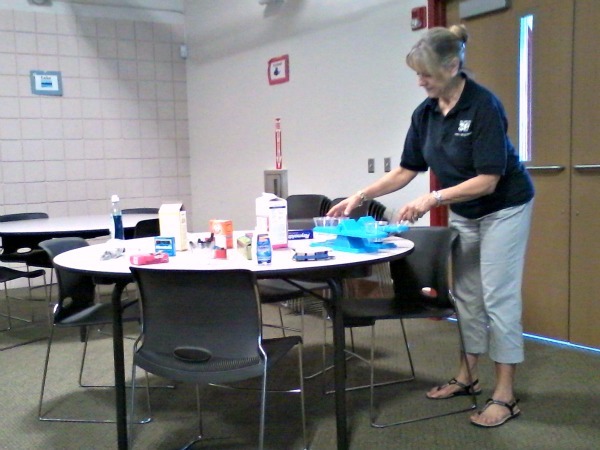 Getting ready to test water samples. High school level activities. 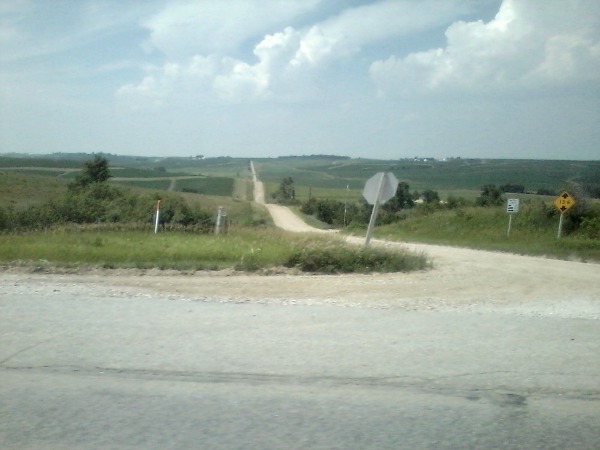 Iowa is such a pretty state to drive. I hadn’t been to this area of the state before. Those rolling hills and that gorgeous sky! 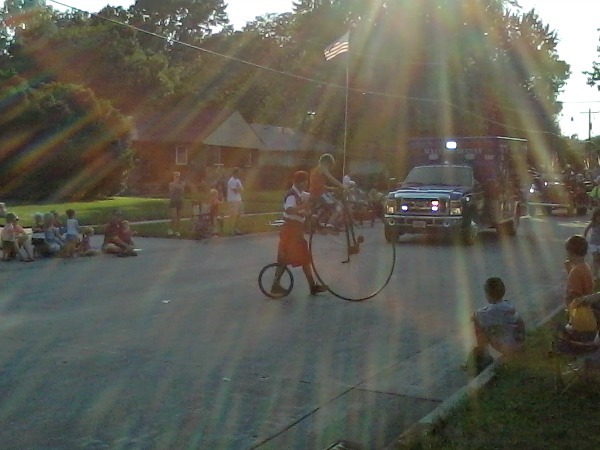 I took on a new job, so I worked most of Wednesday day, then watched the city’s Independence Day parade. My husband is in a men’s group that holds patriotism as a focus, so the younger three were in the parade with Dad and threw candy at everyone. Note to parade entries: Please throw your goodies to the EDGE of BOTH sides of the street. If you don’t, small children will run to the middle of the road and in front of subsequent parade entries and risk being run over, cartwheeled into, and rollerskated on. I loved seeing the man put a kid on his bike. And how funny to see an ambulance behind. I didn’t notice that until now. Thursday began early with a 7:30 a.m. start time for a local 5k. The weather was excellent for running! No one in my family made a PR. 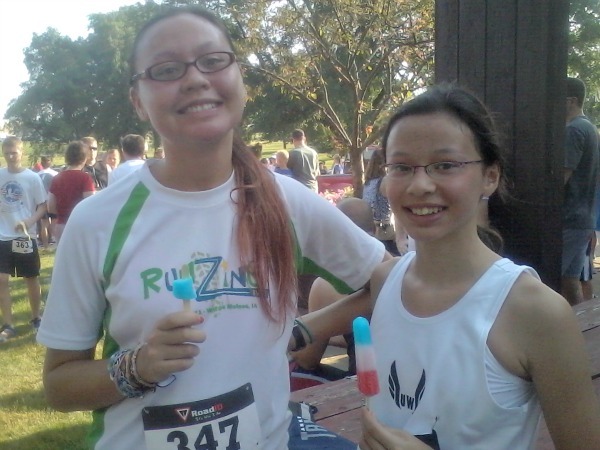 What’s better than bomb pops after a race with your sister? The afternoon was spent swimming, grilling, and watching fireworks. Two of our kids spent their time setting fireworks with friends in the country. By the time Friday came around, I had my days very mixed up. I took the time for a couple multiple day projects with Mr. TellBlast: the refrigerator’s water line and our new drapes. The first project was the water line. I walked into the kitchen on Tuesday night and found the refrigerator in the middle of the room! We do not know how long the water line had leaked. But we fixed it. Boxes of my stuff from my childhood home were soaked, so I sorted through many things over the weekend. The kids were entertained by my stuff, and I was able to see my grandma on her birthday on Saturday. (Can you imagine being pregnant in July in Iowa?) I moved everything that I wanted to save into a new plastic box. The second project was our new drapes. I’ve wanted to replace our drapes for years. When I made the pulled string burlap drapes, they came together very nicely. However, our hands were discoloring the fabric and the curtain rod was not mounted well, which causes madness in Mr. TellBlast. I thought a nice unbleached muslin with orange and violet ribbon trim would look nice, but really really didn’t want to use the brain power to make new ones. I was also concerned about light blocking. We went to Ikea for our curtains. They are longer than our walls are tall. I cut a foot off the length and hemmed two of the four drapes. That’s the sucky part — I have to sew four. But it’s easy, and requires very little brain work from me. They set a formal tone to our room and work nicely. I still need to find an appropriate anchor for the tie-backs. This entry was posted in crafting, home schooling and tagged Fourth of July, homeschooling, parade, string art. Bookmark the permalink.